Before you study the basics of SQL joins it would be a good idea to create some tables for your analyses. You will need at least two tables having at least one column in common. Although you can execute self-join queries on the same table, let's ignore that fact for the time being. Let's now insert some records into the tables. You now have two simple tables ready. Let's now proceed towards studying the basics of SQL joins. SQL Joins allow you to collate two or more (sometimes just one table) tables using common identifiers. Take the example of the above two tables that you created - both the tables have id column in common. You may question the need of joining in SQL. Let's discuss this in brief. Due to normalization constraints, you may not have all the required information present in a single table. Normalization is not only desired but also is necessary in order to maintain consistency, to reduce redundancy and to prevent several insertions and update anomalies. Consider the above two table again. Suppose you wish to find out the streams in which Sayak has enrolled. To get the answer to this question, you will need to join the two tables (sub-queries can also be used, but let's not consider that now) and then proceed accordingly. For two tables to be joined there has to be something in common between the two. Does this mean both the tables have to have at least one column with the same name? Or what exactly is this condition? 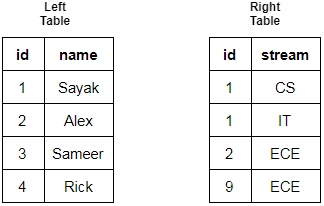 The tables you wish to join may not have a column with the same name, but logically they should be the same, i.e., their data-types should be the same. You cannot join two tables having a column with the same name but different data-types. 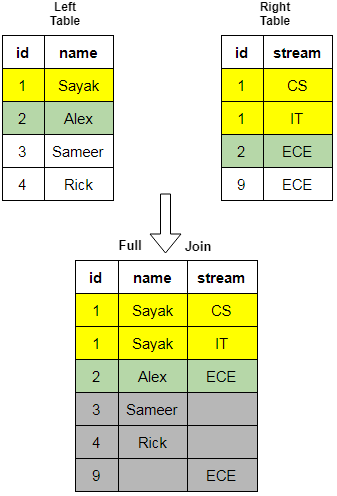 Let's now study the different types of SQL joins. PostgreSQL provides separate keywords for the types of joins mentioned in all capital letters. Let's study each of them one by one. For this, you will first study the joins visually, and then you will execute the respective join queries in PostgreSQL. In the above example, the column under consideration is the id column. INNER JOIN will ignore rest of the columns for which the values are not common in both the tables. 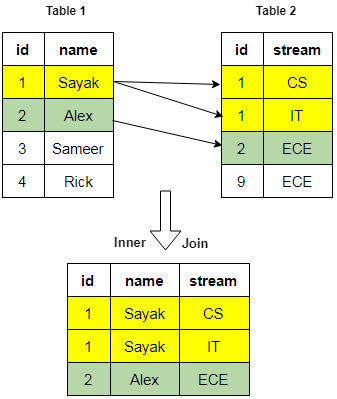 Let's now execute a query in PostgreSQL which would perform INNER JOIN between the two tables - student_name and student_stream. Note that you can execute all the above OUTER JOIN queries using the USING keyword. Let's now study CROSS JOIN. 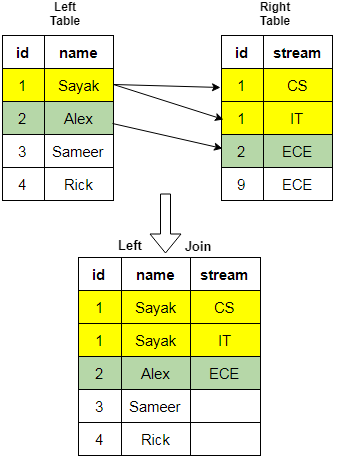 Let's now see the other two types of join for which PostgreSQL does not provide any direct keywords. Semi Join queries are generally executed in the form of subqueries where rows are picked up from the first table with respect to a condition (or a set of conditions) that is matched in the second table. Let's assume the left table is the first table, and the right table is the second table. Note the use of NOT the above query. That is all for this tutorial. You studied about a bunch different types SQL Joins in this tutorial and also made yourself familiar to their PostgreSQL syntaxes. If you want to practice some challenging SQL Join exercises, you should take DataCamp's Joining Data in SQL course. In fact, materials from the course were used as references to make this tutorial. Let me know your questions in the Comments section.